*	Your inventory (B) is located in the lower panel - select an item to use it. *	The inventory auto-hides, move your mouse down to reveal the panel. *	Hints are unlimited, but you must wait for the meter to refill (D). *	Hidden-object scenes and mini-games are often randomized - your solution may vary. *	Hidden-object scenes will be referred to as HOS in this walkthrough. *	Hidden Object items listed in yellow are hidden or require additional steps. 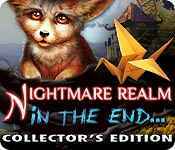 Sign-up to get informed when the Nightmare Realm series has new game released with BD Studio Games' FREE bi-weekly newsletter.